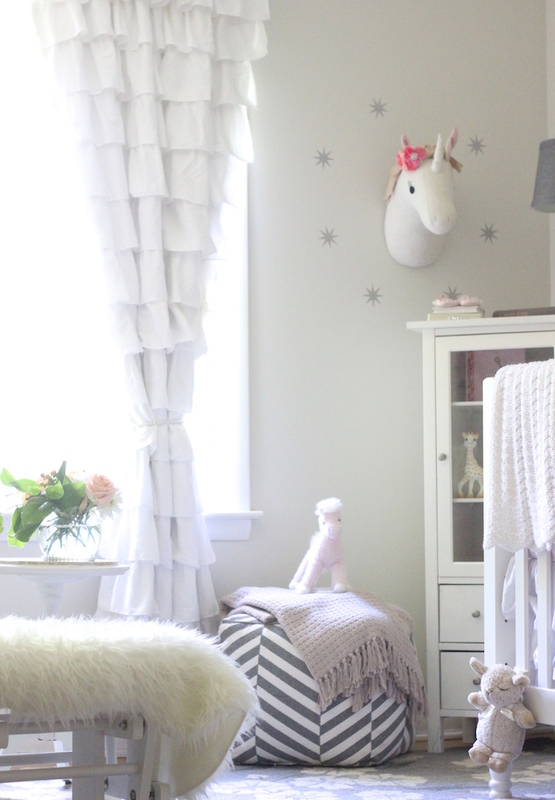 We finally hung a few things in Kinzie’s nursery and although it is not completely finished, I had to share a couple things I love about it! 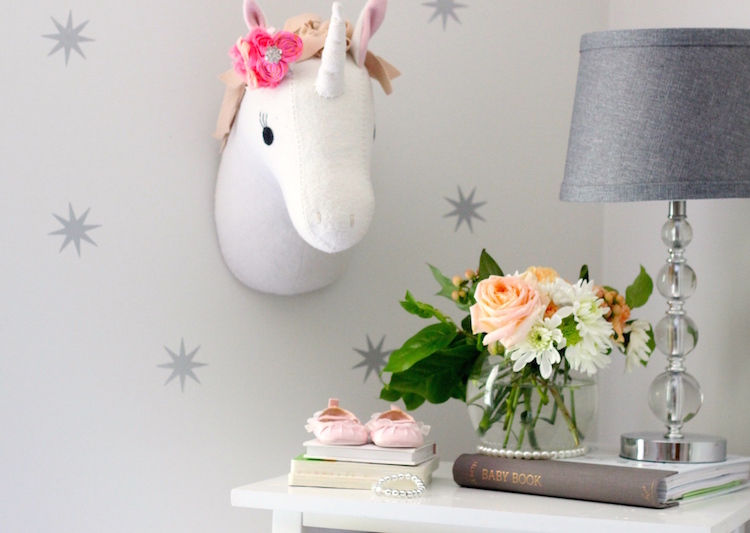 It’s filled with floral accents, unicorns, and playful items. 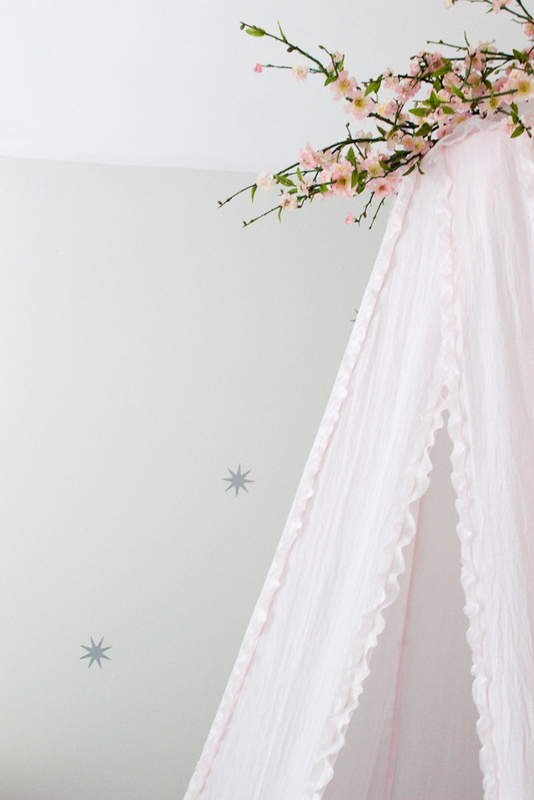 Whimsical and serene. A great mix for a baby! And 2nd, we moved into this house right before Kinzie was born and I didn’t have time to paint. I was so eager to get it ready that I put it together as quickly as possible. It’s been 2 months now and guess what? We are finally painting this weekend!! 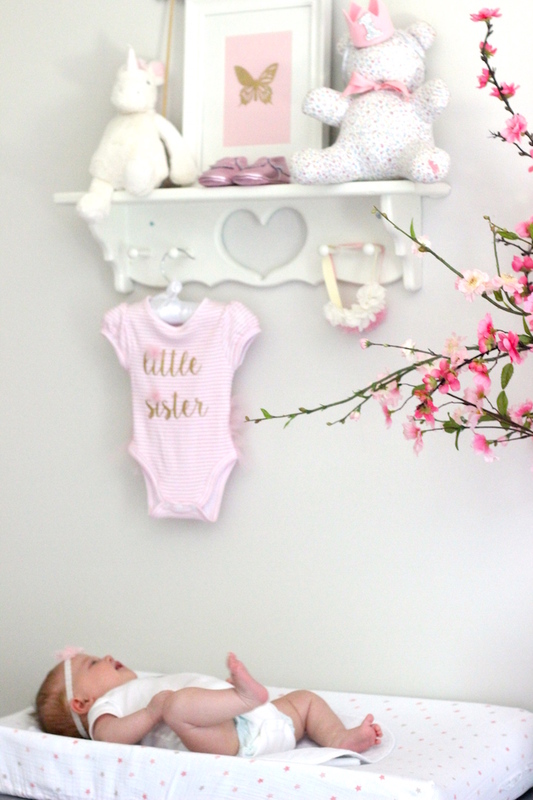 So, I’ll probably share more photos down the road with a prettier wall color but for now, here’s what her nursery looks like today! 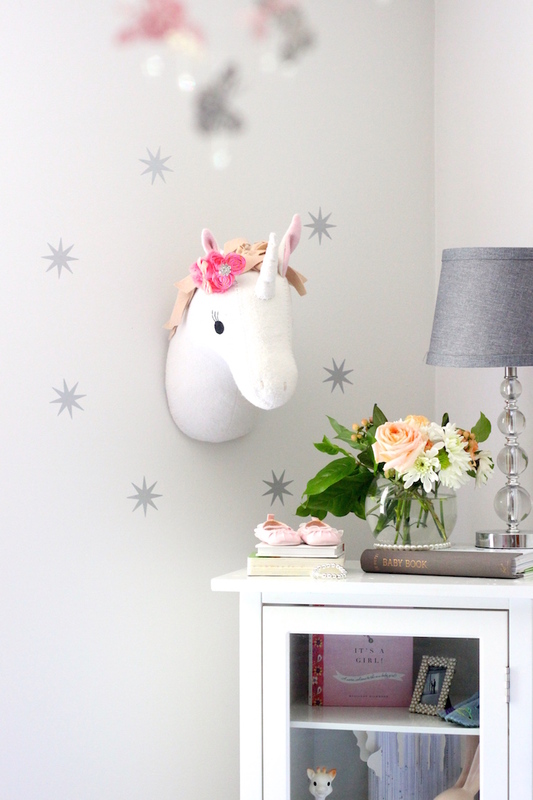 How cute is this unicorn? 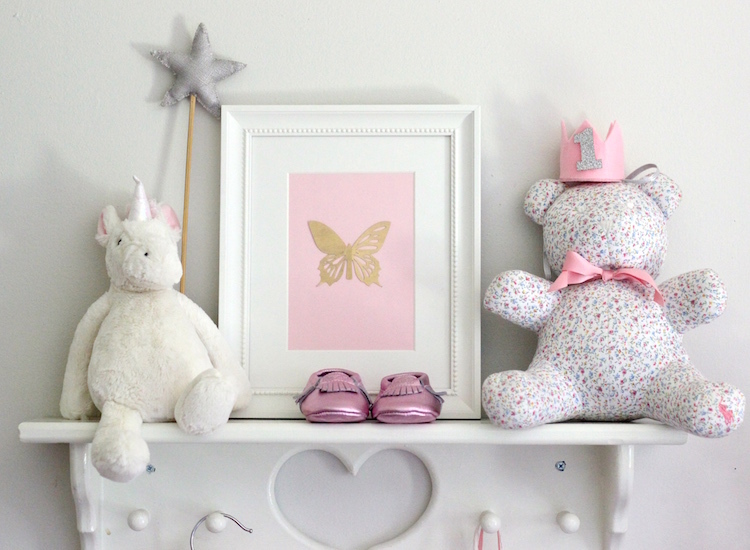 I originally bought it for our gallery wall in the playroom but it looks much better here. 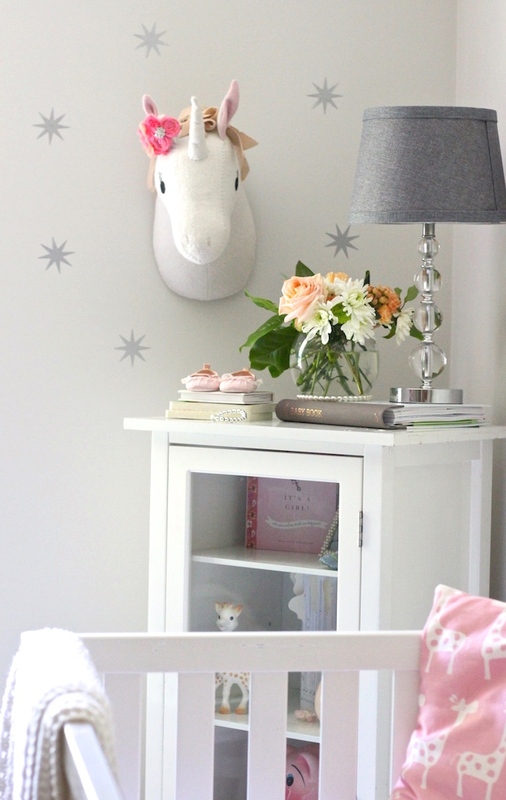 It’s from the Pillowfort line at Target – which is full of fun items for kids rooms. I dressed ours up with a pretty bow and some stars (my mom’s idea!). 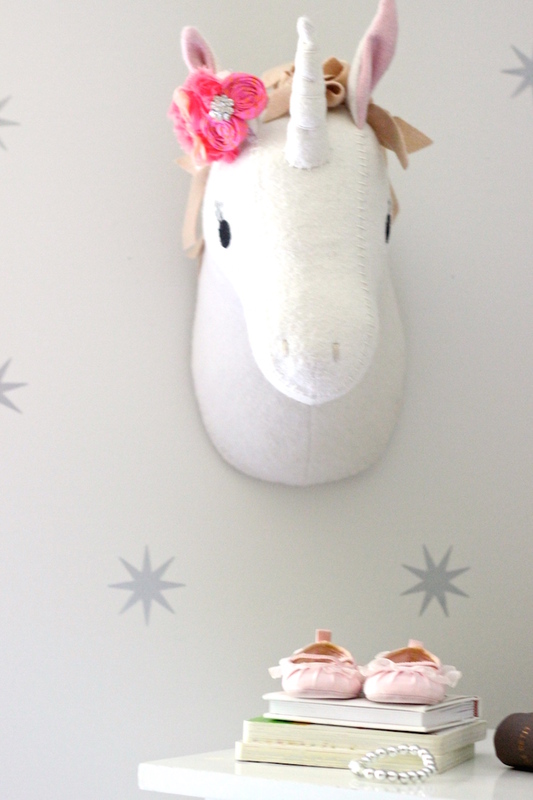 We were between this unicorn and the one at Land of Nod. Both are adorable! This poor glider has barely been used! I researched a TON of rockers and ended up getting this one from Amazon (which was only a little over $100!). This was a little risky since I had hoped to test one out but we took a chance on it. 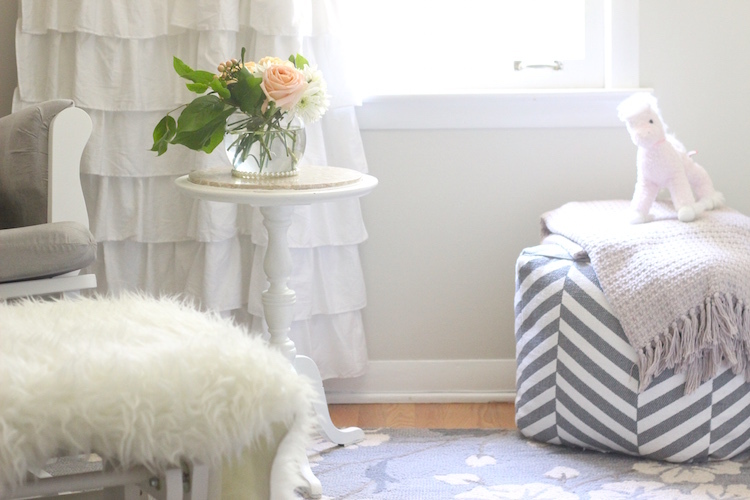 It’s actually really comfortable (and super affordable!) but since Kinzie’s still sleeping in our room we barely use it. 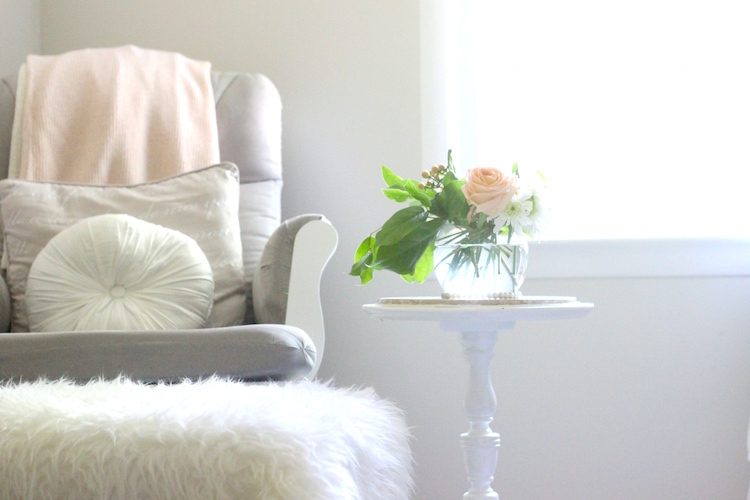 I dressed the ottoman part up with a faux sheepskin which adds some extra comfort for your feet! 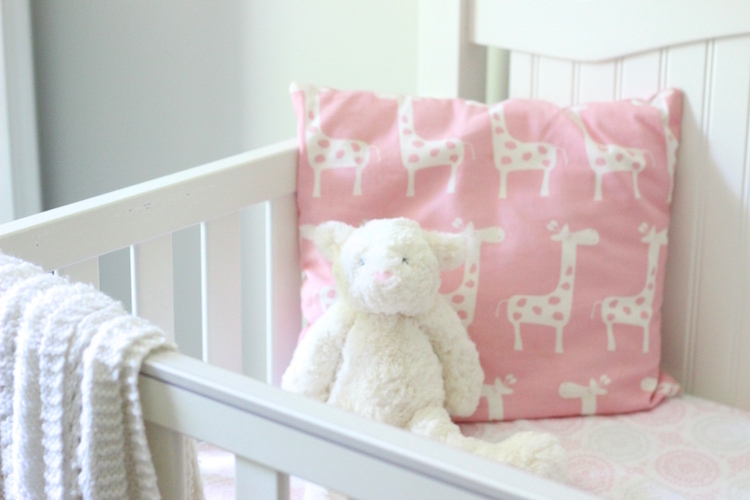 Although this is in Kinzie’s nursery, it is used quite often by Taylor, our 2 year old. 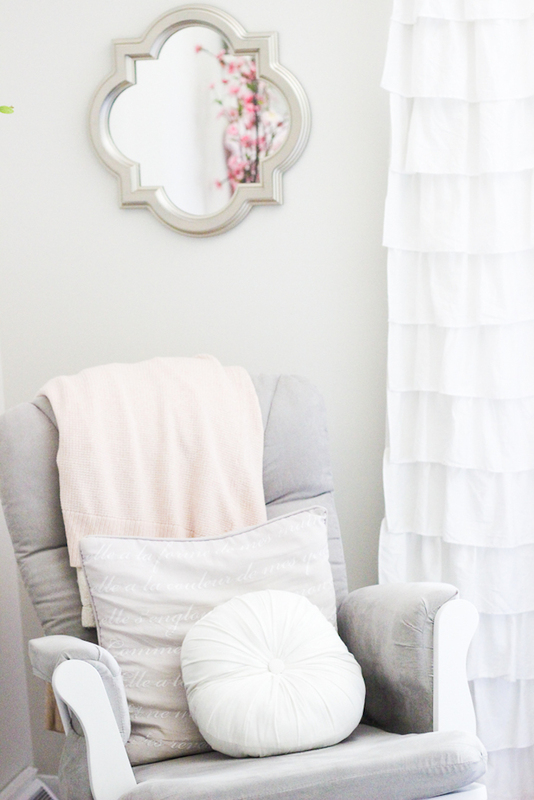 This cozy little corner is perfect for reading stories before bedtime. So, of course, it needed some stars around the canopy. These are the coronata stars in silver btw. Did I mention you can get all their decals in just about any color? Also, this canopy was from Target too (can you tell I like to shop at Target?). It’s the ruffled pink canopy. I was eyeing it for awhile and finally bought it once it went on sale (only $23!). The florals were added after. 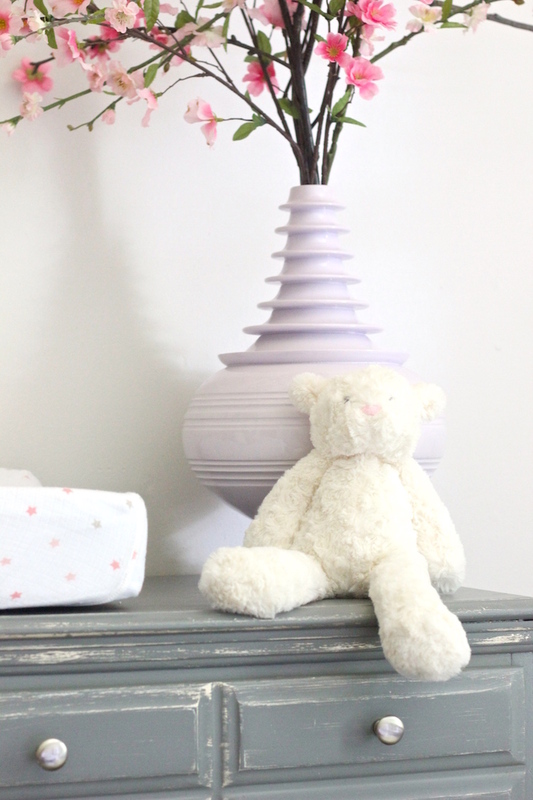 Pale pink… so tempting for a little girl! I like the color it is now but a pink would look pretty too! Thank you Sara! As of today, it’s getting prepped for paint but still need to decide on a color! 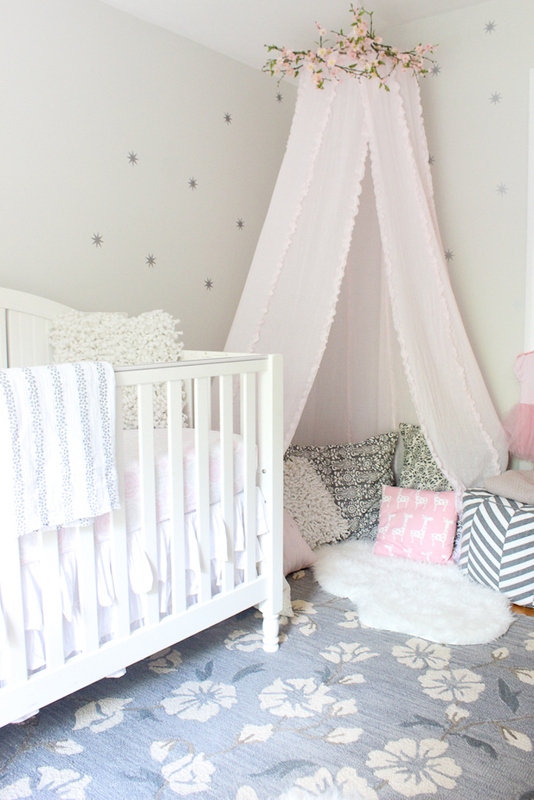 Such a sweet nursery for a precious little girl! 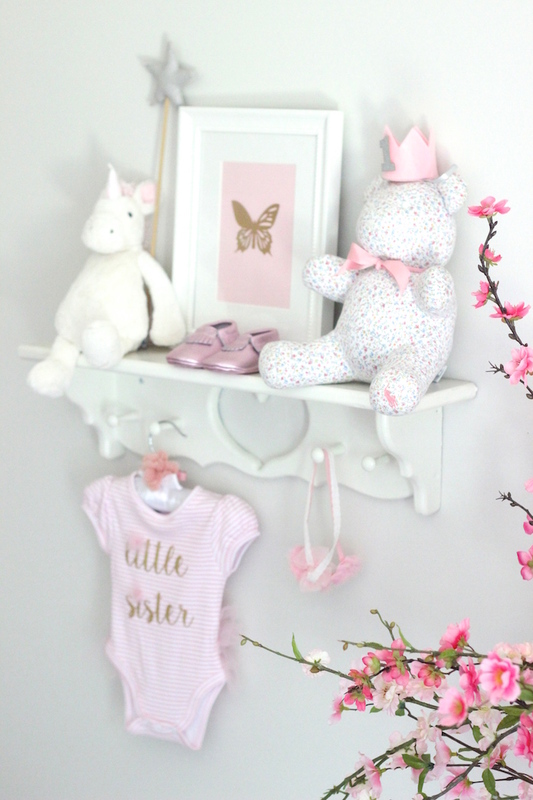 So whimsical and sweet. Just like little Kinzie!